In order to promote the high-level development of “Double Innovation” and create a good atmosphere of “Double Innovation”,the launching ceremony of Jining Shuangchuang Activity Week was held in Jining High-tech Zone Production and Research Base in the morning of October 12. 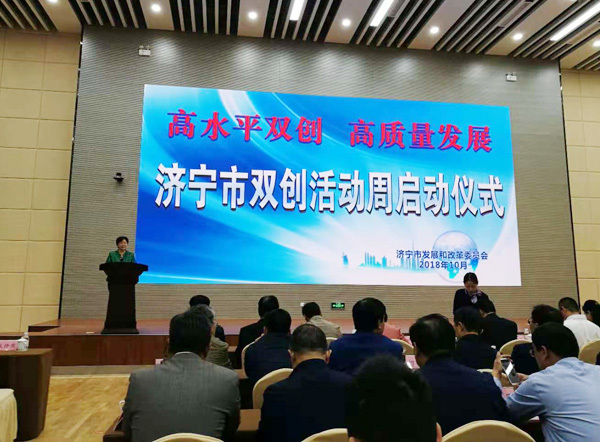 Yu Yongsheng, Jining Municipal Committee Standing Committee and Executive Deputy Mayor ,Sun Gongxun,the member of the Party Working Committee of Jining High-tech Zone and Deputy Director of the Management Committee Sun Gongxun attended the launching ceremony and delivered a speech. The meeting was chaired by He Yonghong, Director of the Jining Development and Reform Commission and party secretary. At the meeting, the list of Jining City's 2018 dual-creation demonstration base was announced, and China Transport was successfully selected. Han Yong, Executive Deputy General Manager of China Transport, attended the launching ceremony on behalf of the group. 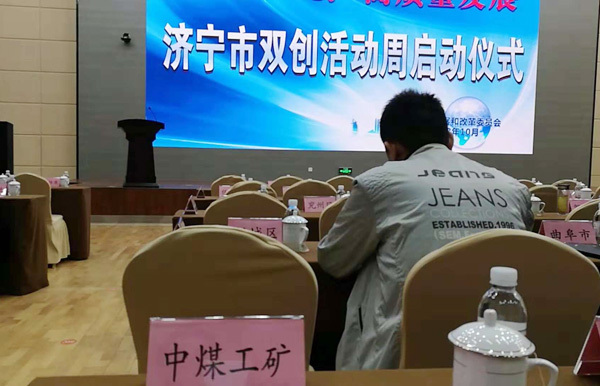 Yu Yongsheng, member of the Standing Committee of the Jining Municipal Committee and Executive Deputy Mayor, pointed out in his speech that in recent years, the municipal party committee and the municipal government have attached great importance to the work of Dual-Creation. Under the joint efforts of all parties, the “Double-Creative” activities have flourished, in order to stimulate innovation potential and market vitality and expand. Employment has played a positive role. He demanded that in the face of the new situation, all units should take the guidance of Xi Jinping's new era of socialism with Chinese Characteristics as the guide, conscientiously implement the decision-making and deployment of the Party Central Committee and the State Council, and aim at "High-level, High-quality, High-quality development" and implement innovation more. Drive the development strategy, continue to promote the "Double Innovation", and hope that the majority of entrepreneurial innovators keep up with the trend of the times, grasp the development trend, seize the development opportunities, brave the public entrepreneurship, the innovation of the tide, write entrepreneurial innovation legend, for the construction of Jining make more contributions. At the launch ceremony, a list of Provincial-level and City-level Twin Innovation Demonstration Bases was published. 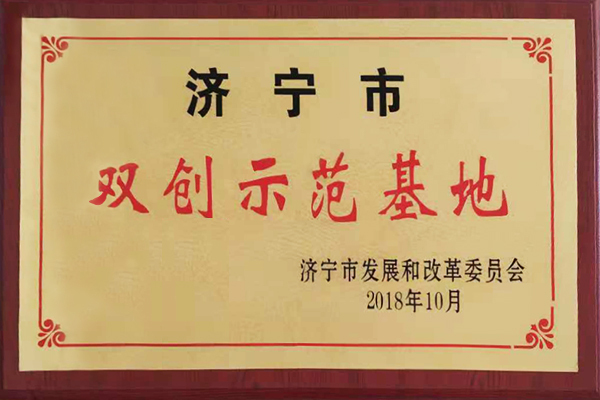 With outstanding achievements in enterprise innovation and transformation development, China Transport was successfully selected into Jining Municipal Twin Innovation Demonstration Base in 2018 and awarded plaques.As a large manufacturing enterprise, China Transport actively respond to a nation "The Public Business Peoples Innovation ", accelerating the old and the new kinetic energy transformation, enhance the level of manufacturing industry and Internet integration development, promoting industrial transformation and upgrading, through the introduction of foreign advanced robot technology concept, the development of Chinese high-end intelligent products, has successfully developed industrial robot, service robot, household robots, fire-fighting robot, plant protection, entertainment robot drones more high-end products, such as led and the rapid development of the intelligent terminal industry in Shandong Province of Shandong,become the national through the integration of innovation to boost enterprise transformation and development of the industry model! At the same time, China Transport also vigorously develops the construction of cross-border e-commerce platform, and independently develops and operates the industrial internet platform of coal machinery industry -- e-mine cloud, which is listed as a key support project of cross-border e-commerce and a key platform of e-commerce in shandong province by the ministry of industry and information technology.It can be said that in the process of the establishment of the model base, China Transport actively explored new business model, organization mode and management mechanism, released the internal innovation vitality of the enterprise, and made positive contributions to promoting the comprehensive transformation of Jining's economy and society!